We always knew there was more to that 'Ready to race' tagline of KTM's. Of course the Austrian manufacturer has always been involved in various forms of motorcycle racing around the world, but it has recently been revealed by speedweek.com that KTM will make a return to MotoGP in 2017. The manufacturer is already working on a new motorcycle - the RC16 that will feature a 1000cc V4 engine. 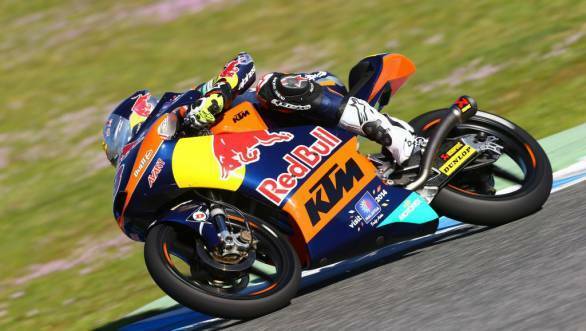 Speaking to speedweek.com, KTM CEO Stefan Pierer said that there were several reasons that contributed to the decision to return to MotoGP, one of which was the fact that they were bringing into production the RC16 motorcycle. Pierer stated that with this track only motorcycle in production, and the fact that the technical specifications of the motorcycle are in keeping with the 2016 regulations of MotoGP, it made sense for them to make a return to the sport. The last time KTM was involved in MotoGP was in 2005, when they supplied engines to Team Roberts. Pierer also reportedly revealed a general timeline for the MotoGP development, stating that the 1000cc V4 engine will be put through testing by May 2015. The motorcycle will go on sale in the autumn of 2015, with the race-spec bike continuing to be developed all through 2016, with the possibility of a few wildcard entries in 2016 as well. The aim for the 2016 season will also be to find quick test riders, is what Pierer declared. Stefan Pierer also revealed that the team competing in MotoGP won't be a factory entry, but the motorcycles will be available to customer teams. While the company is yet to reveal further details to the press, we're expected to hear more from KTM soon. Ready to race indeed!